Approaching Charles Bridge from the Old Town, the museum is on the right-hand side, accessible via steps. The Charles Bridge Museum (Muzeum Karlova Mostu) explores the history of Prague's foremost river crossing, the 14th century Charles Bridge, which links the Old Town with the Lesser Town. 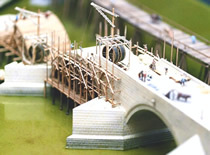 The museum explains in detail the structure of the bridge and the different stages of its construction. It does this using miniature models, original artefacts and replica parts, and shows the materials used and the tools required. This visual approach, including some explanations in English, make it easy for people of all nationalities to grasp the process. The exhibition also covers the lives of the artisans who worked on the project, and shows what life was like for them in Prague during this early medieval period. The museum is located below water level, a few metres along the river from Charles Bridge. This is significant, for this is where its predecessor, Judith Bridge, the first stone bridge in Prague, spanned the river. Visitors to the Charles Bridge Museum can see part of the original foundations of Judith Bridge; most of the bridge was washed away by a huge flood in 1342, an event which prompted the construction of Charles Bridge. In a separate area of the museum, visitors can see the foundations of Krizovnicka Church, which was of Gothic construction. These lie below the present day St. Francis Church, which was built over Krizovnicka during the Baroque period.